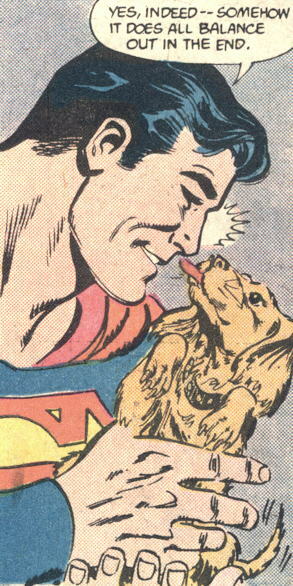 …because Superman with a puppy makes everything feel better. Tom Mandrake….inked by Don Heck? Is that how that was done in this issue? That is quite the combo of styles, eh? Now I need to find this issue and acquire it! This image kind of sums up the entire blog. Aww, poor Mike :( I hope you feel better real soon! So the issue was called DC Presents Superman and A Puppy?